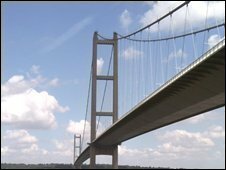 The government has approved a £6m grant to help cover maintenance costs on the Humber Bridge - ensuring a toll freeze for at least 18 months. The Humber Bridge board wanted to raise the toll by 20p for cars to help pay off the bridge's £330m debt, but it was refused permission to do so in July. At the time the board said it may have to precept local authorities in order to keep up its repayments. The £6m grant, announced on Tuesday, has been welcomed by the board. The money will be used towards the cost of installing a dehumidification system that will prevent corrosion on the bridge's suspension cables. The bridge board said it faced a £1.15m budget shortfall when the toll increase was refused. It said the grant meant the shortfall could be met through the board's cash reserves, which would otherwise have been required to fund the new system. The grant announcement follows a series of meetings between board members and transport minister Sadiq Khan. Mr Khan said: "The government is committed to doing everything it can to protect communities and businesses from economic downturn, and to help the country recover. "That is why I recently decided not to accept the Humber Bridge board's proposed toll increase. "It is also why I have today awarded £6m for the bridge board to carry out essential maintenance work." Bridge board chairman David Gemmell said: "This investment will have the benefit of reducing future maintenance costs on the bridge, with a positive effect on the future level of tolls for those using it. "This means that there will be no further toll increase before 2011 at the earliest, by which time tolls on the bridge will have been frozen for five years."